I've just had my first test sail using a 100 sq ft cambered junk sail on my 24' Wa'apa. I have to give credit to Mike Mulcahy and his Duckworks article, and to Arne Kverneland of the Yahoo Junk Rig forum for inspiration. I've gradually realized that I've been deterred from some expeditions because of the limited reefing capabilities of traditional Oceanic sails. The Chinese junk rig is famous for being the quickest and easiest to reef, but it has also gained a poor reputation for windward ability in modern adaptations. Modern stiff sail fabrics can be blamed for much of this problem. The junk sail is traditionally cut as a flat panel and this worked well with old style stretchy fabric which would form an airfoil shape when the wind started blowing. When polyester fabric was used in a flat cut sail, no shape was produced and neither was much lift. 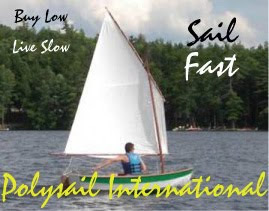 My heavy duty polytarp cambered junk sail is made up of individual barrel shaped panels that are sewn together at the batten locations. The battens are two pieces screwed together through the fabric and are intentionally very stiff. The bottom batten is also the boom and the yard at the top is a stiffer spar. The leech along the bottom three panels has a 5" extension called a Gurney flap. There is some argument about the effectiveness of this device, but I will stay with it for a while and cut it off if it does more harm than good. So far it doesn't seem to hurt the otherwise excellent performance. I don't have any GPS tacking angle data yet due to a battery problem, but will get that the next time I'm out. It's winter here and sailing days are few and far between. Great clip Gary, I like the new look to the blog too. The junk rig looks good and seems to perform well too. Thanks for the clip. I also like the new look to the blog. The wind speed averaged 8-10 knots with some higher puffs. I got the boat speed up to 8.4 a couple of times in the puffs. Thats not bad at all , I think. Gary , is your Wa`apa flat in the centre section , without rocker , with upturned ends ? The reason I asked is because I`m wondering how difficult it becomes to tack , with a flat rocker in the middle. Do you need more room to come about , or is it not a problem ? The hull is entirely flat with no keel or deadrise. There is rocker fore and aft and the amount of that rocker does affect tacking ability. It was slower to tack with the conventional rig and improved with the junk rig mainly because of that little bit of sail area forward of the mast that balanced the sail plan better. I always wonder about the actual amount of camber required in those sails. Do you calculate the camber as a percentage of the length of the panel ? The choice of fabric is interesting. Do you think there is a material that is still available today that could be used that will give enough stretch to have a flat cut sail ? I`m thinking maybe the old fashioned Egyptian Cotton maybe ? The sail appears docile , yet with a good amount of drive. The rig " looks right " too. Love the blog , fantastic ! I didn't calculate the camber but just followed the instructions in the Duckworks article. The barrel shaped panels were cut for 5% camber and the Gurney flap adds another 5% for a total of 10%. Arne's articles in the junk rig forum explain how to calculate it. I don't think I would do a flat cut with stretchy nylon or something because of the unpredictable results. Very good work and great clip too. What about the mast dimensions? Is it a no stayed mast? The mast is 4.5 meters long but would be better at 4.8 to give more clearance below the sail. The un-stayed wooden mast has a small hollow up the middle and is 65-70mm in diameter. Looks good Gary, but I am a bit surprised by your comment about the reefing limits of other rigs. As I understand it, you present a tacking rig for Wa'apa and Tamanu - a fiberglass windsurf mast with sail that furls around mast - saying mast will bend and spill wind, and sail is easily furled. What am I missing? You are right of course about mast roller furling. It is just as easy as the junk. I was referring to more traditional rigs. I'm interested in hearing more about the performance of the cambered junk rig compared to the oceanic lateen. 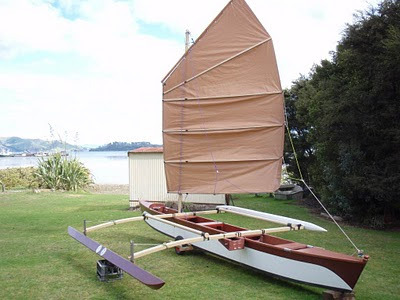 I'm building a 16' Wa'apa and really like the idea that I might be able to try the junk rig in a tacking configuration and also as a proa, coping James Brett's rudder arrangement. I also like the combination of reefability and simplicity. Let us know how these experiments pan out. Good to see how well you are doing. Just for the sake of research and development: I hope you one day take the trouble of removing the Gurney Flap and then tell uss in the Yahoo JR group if you experienced any differ3nce in performance. Why not join the Junk Rig Association (www.junkrigassociation.org)and tell them too? A member has uploaded a link to your video to the site. Get your copy of Building Outrigger Sailing Canoes from Amazon.